Wills, trusts, succession plans, powers of attorney, medical powers, living wills and the like all are critical documents in an individual's estate planning. However, GAPS are inevitable. The 40+ pages of the Family Love Letter booklet helps fill in these gaps. It completes the planning and colors in the general sketch most people draw for their families, business partners and professional associates. Includes 1 pad of Family Love Letter posty-notes. Created with thought-provoking sections, tables and fill-in-the-blanks on everything from your professional advisor's contact information to the passwords on your computer to what you would like to be remembered for, the Family Love Letter is an indispensable planning tool. Order one for yourself and one for each of your family members so they can capture the information that is essential to their planning. Or if you are a business owner or professional advisor, the Family Love Letter booklet is an excellent way to provide a value-added service to your employees and clients. 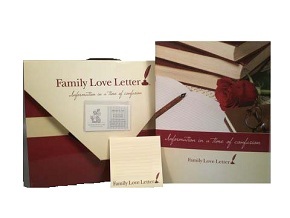 For international orders, call 866-770-4FLL (4355) or email dpagano@familyloveletter.com. 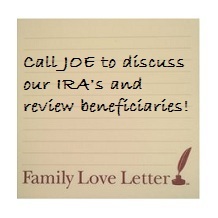 If you have interest in co-branding, please call 866-770-4FLL (4355) or email dpagano@familyloveletter.com. 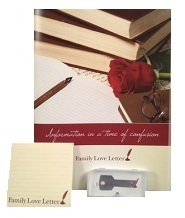 The Digital Family Love Letter encompasses the printed Family Love Letter, now with added security and ease of access. The Digital Family Lover Letter encrypts your personal and financial data onto a thumb drive. The “RED BOX” serves as a central, easy to store location, not only for your Family Love Letter, itself, but for all the supporting source information. 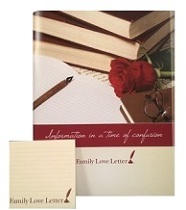 The “Red Box,” includes a complimentary copy of the Family Love Letter Booklet, 1 posty-note pad, along with 8 file folders, 5 of which match the five sections of the Family Love Letter, and 3 left blank for your specific titling. Your “RED BOX” will organize all the specifics you addressed in your Love Letter to your loved-ones. Complete the work you have done by assuring everything of importance is in one place - your Red Box. 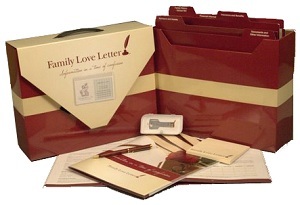 This is a complete kit which includes The “Red Box,” a complimentary copy of the Family Love Letter Booklet, 1 posty-note pad, as well as a copy of The Family Love Letter Digital Drive. The Family Love Letter Posty-Notes are great with helping you with reminders!